There are only a handful of people alive who can actually claim to have changed comics; Don McGregor is one one of them. From writing the first interracial kiss into a mainstream comic to creating one of the first graphic novels, Don has been a pioneer the world of comics. 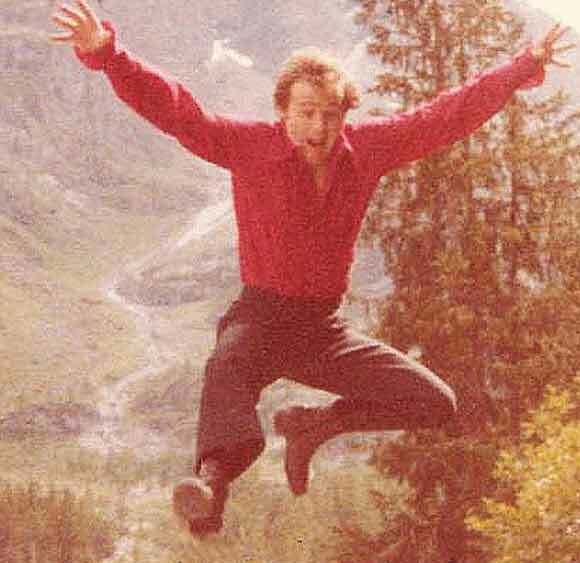 The puffy-shirted wild man Don McGregor of the 1970’s. I remember meeting Don McGregor back in 1996 at San Diego Comic Con. He had the the booth across from me and at one point early on, he leaped up on his table in a single bound, dressed in a puffy sleeved shirt like a swashbuckler. He was loud, verbose, and infinitely entertaining. This is Part 1 in a series of interviews with Don McGregor about various aspects of his colorful career. You wrote the first interracial kiss into a color mainstream comic script back in the 70’s. Today, people younger than you and I might not think that was such a big deal, but it really wasn’t too long ago that that sort of thing was verboten. What did you have to go through at Marvel to get that into a comic back in those days? The hallowed halls were a minefield. I was so naive. I believed in the Bullpen in print. I never understood why people were shocked by Watergate. They’re politicians. Business as usual. But I guess I wanted to believe in the Bullpen Bulletins. It was a creative environment. I didn’t realize that there would be so many agendas and that there were people who would be prejudiced and did not want any color but white in the books, and certainly no intermingling between people of different colors. I had planned to get M’Shulla and Carmilla Frost together right from the beginning, but I had to figure out how I was going to be able to get them together so that it would see print. In answering this, I know it’s difficult for some people to know where this country was at in 1973 with some people. There were certainly no interracial couples in comics. There were certainly no gay couples in comics. 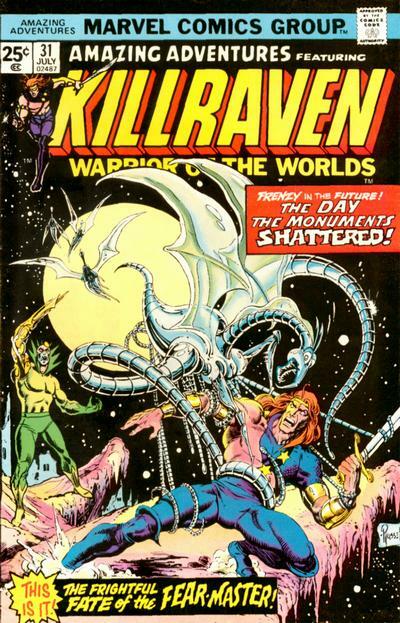 I had planned to do both, if I could figure a way that Marvel would let me do it, in Killraven and Jungle Action. If you read through both series, you’ll note early on that there are scenes where M’Shulla and Carmilla have a scene together, just the two of them, in Jungle Action, it’s Taku and Venomm. I had to be even more careful with the homosexual couple. If I’d gone there, that would have probably been my last book long before the Ku Klux Klan issues. An artist had gone to the editor and complained that if I’m doing a salt and pepper relationship in this book, he wants off it. He won’t draw it. I’m called into the editor’s office, and I’m wondering, what is this going to be about now. It’s now like being in the Principal’s office, and I’m the bad student who has been squealed upon. What am I doing in Killraven? Is there any truth to what the artist says. I know it is way too early to talk about this. I had been around long enough now to realize how things worked. It wasn’t enough that I wanted to do it. I had to find a way to get it to paper reality, into the reader’s hands. Now, if I said yes, and then I was told that “No,” under no circumstances could I do it. I would be trapped. If I tried it, it would be open defiance, and it would never see print so what the hell would be the use of going that route. But how do you get from here to there? I answered at the time that those sequences were a kind of Modesty Blaise/Willy Garvin relationship. By using a reference to Peter O’Donnell’s Modesty Blaise newspaper strip, it would be a reference point well known and understood by comic book people. This bought me some time. And my hope was that the readers would start asking me in letters, “Don, when are you going to let them get together?” as the series progressed. One of the few things I knew about Stan Lee was that he really did want Marvel to be the first to do things in comics; he liked the avant-garde reputation Marvel had built up over the years. I knew the only way I could do something like an interracial kiss there was if it was okayed by Stan. But I couldn’t just go to Stan with this, bypassing editorial. If there are unspoken rules about what gets done and what doesn’t get done in comics, there is also protocol. If you break that protocol, especially if you’re working on staff, you are still going to have to work with these people on a daily basis. And they are going to be royally pissed off! It’s almost like an all-out declaration of war, and if that happens, they’ll be watching you a lot more closely and with animosity. I was already on the fringe of the Hallowed Halls so it was all kind of dicey as to how it would play out. I waited until I thought I had enough letters, and then I went through editorial, asking to set up a meeting with Stan so the issue could be discussed. I felt I knew the way to approach Stan on this, appeal to that desire for Marvel to be the first. Rumor had it that DC might do an interracial kiss in one of their non-series romance comics. Although I have no idea if that actually ever occurred, but when the big meeting came I certainly made sure that Stan knew DC was contemplating doing it and told him, “Wouldn’t it be a shame if DC has an interracial couple before Marvel?” Well, Stan clearly didn’t want that. And we circled this aspect of it, my coming back to, whenever possible, what a shame it would be if DC did it first when Marvel’s fans loved the idea of Marvel being first. Stan asked, “But does she have to white, Don? Can’t she be green?” I shrugged. A whattayagonnado shrug. “But Carmilla isn’t green, Stan. She can’t suddenly become green.” And Stan was concerned that some Southern states would hold the comic up at a PTA meeting, protesting what their kids were seeing. Finally, it was decided that I could do it, but that the panel where M’Shulla and Carmilla kiss would be done in knockout colors. Essentially, that term means both characters would be done in one color, both of them purple, or something like that. This way, I guess, the thought was no one could hold the page up in high dudgeon and rant about race purity or whatever the hell it is they do. Now, just before the comics come out, coverless copies come a little earlier, I don’t think more than a day or two before. That’s when editorial would really see the insides of the book as they looked through them. When the make-ready came in on Amazing Adventures #31, “The Day the Monuments Shattered,” I was called into the editor’s office almost immediately. The door was closed. That was always a bad sign. I really didn’t know what it was this time, but I think there had just been another all-black cast discussion in “Panther’s Rage,” so it probably wasn’t that. And it wasn’t. It was about the kiss. 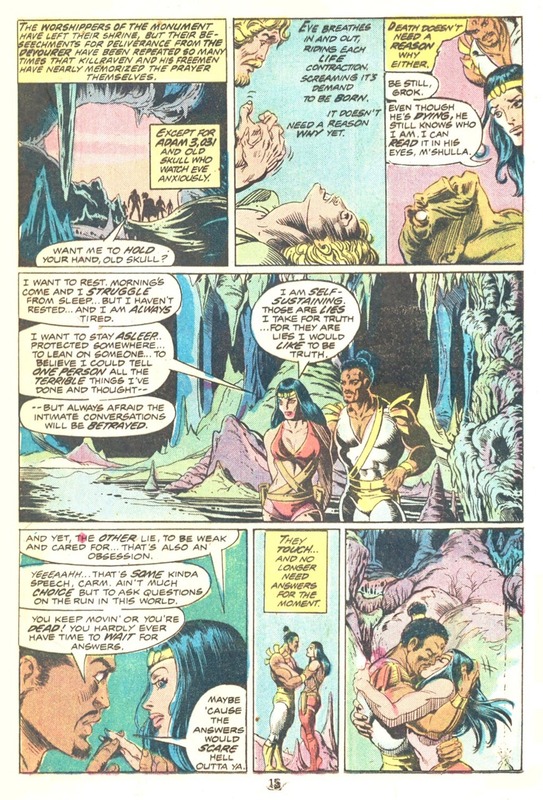 The editor held up “Killraven,” and there were M’Shulla and Carmilla, locked in embrace with beautiful coloring by Petra Goldberg, who had both Don McGregor and Craig Russell with definite ideas. And the panel was not in knockout colors! But here’s the thing: The sky did not fall on anyone’s head. That kiss did not have hate mail flooding the offices. It apparently didn’t hurt sales, and it didn’t apparently help them, either. But now, interracial couples had been introduced to Marvel comics, and it would be easier to have people of different diversity be represented in the medium. The battle to do it would not be so hard the second time around.